Provide safe drinking water to the community members and school children and teach them to handle safe drinking water. •	To reduce the health risks related to use of contaminated water from rivers or lakes. Tamil Nadu is the South Indian state that has been hardest hit by the tsunami. Human lives and live stock has been destroyed in big numbers. Salt water has been intruding into the agricultural land, shallow aquifers have been affected by sea water which has implication on both health and water use in agriculture. The Project will enhance the livelihood for the community members who are living nearby the coast by providing safe drinking water through a fuel efficient tool called ROPE PUMP. Project will be working in Parengeppati block of Cuddalore district, where HPPI has establish its ECO Information centre and working closely with the community. 5 Rope pumps will be placed at public palces in 5 villages and 25 families will getting safe drinking water at all time. 5 Rope pumps will established in Schools in the villages where more than 300 children will get benefit from each rope pump. Community members and school children will get fresh water and will reduces water borne diseases. It will also benefit the community members and technicians to learn the knowledge on how to install, operate and maintain Rope Pump. The basic elements of the Rope pump are an endless rope with conical shaped pistons at every meter, a wheel and pipes in a borehole. The rope with the pistons is lifted with the wheel. In this way water is lifted between the pistons to the surface. It’s easy to operate and maintain and it is an energy efficient device. It is low cost, made of locally available material and easy to maintain.
? Water can be lifted from depths of 1 to 65 Meters (200 Ft).
? The rotating movement avoids dynamic forces, a problem in traditional deep well piston pumps, thus making it very easy to pump up water.
? All parts of the pump can be produced with local skills and materials.
? Repairs can easily be done by users or local caretakers.
? It is affordable – in India a Rope Pump cost around Rs 3000/-. The total cost of one pump and bore well of 15 m is around Rs 7,500/-.
? Because of its low cost and simple design this technology has proved to be very sustainable. Evaluations have shown that if the pumps are introduced properly, over 90 % are working, even 10 years after installation. YES The proposed proposal is for six months. For the overall success and sustainability, the project will form a Village Development Committee in each of the implementation villages. The VDC’s will consist of at least 11 members drawn from every section of the community, so as to represent every strata of the village at equal level. The foremost task of the Village Development Committee is to mobilize people in the community to take part in the project activities. They will participate in the mobilization, home visits and meetings with the community, where they will hold educative sessions on the installation and repairing of Rope pump, and they will identify and select the sites where the Rope pumps will be installed. 4- Two village elderly, who have influence in the community. 6- One primary health centre official. It will be the responsibility of the Village Development Committee to follow up on the maintenance of the rope pump after the installation. The project staff will work closely together with the Committee members during the entire project life to ensure a thorough training of the Committee members and secure effective function of the Committee. Program is connected with the Community members and project have plans to link the activity to stakeholders like panchayat raj institutions ,CBO'S and block level officers. The project will enhance the skills of community members on production, installation and maintainance of rope pump.It will also promote kitchen garden and treating of waste water around the water source. The project will reduce health hazards specially in women and children. regularty of school children in the schools. Kusum had sent me a short video on the rope pump which i have now attached to the application. Project Well would be interested in seeing how it can be transferred to Bengal, while El Porvenir would be interested in seeing the adaptations. Also, please note that there are 2 nearly identical proposals for rope pump installation and Ekoventure's application will not be reviewed but will inherit the Q&A and discussion of this one. Is the community contribution or its value nothing? What is the plan for long-term maintenance and estimated costs for maintaining pump and associated structure. Is the community contribution or its value nothing? What is the plan for long-term maintenance and estimated costs for maintaining pump and associated structure. I don't quite understand the need v the solution. If there is great need because of salt-water intrusion, can you expand on it? - What is the current situation? Sources of water? - What are the people doing now? - What is the school situation? - What is the health situation (you mention it will be impacted)? If salt-water intrusion is the problem, how will the rope pump help? They will still get salt-water. The proposed villages of Tanjore district (Ekoventure) do not face any salt water intrusion problem as of now. In the Cuddalore district (HPPI), even though there is salt water intrusion - they are in the deep aquifer and we have not faced any salt water intrusion in shallow aquifer. All the 180+ Rope pumps that were installed in our early project - Green Post Tsunami Action are in the coastal villages of Cuddalore, Villupuram, Kanchipuram and Thiruvallur districts of Tamilnadu are functioning well and are being maintained by the Community till now. Though the localbody is taking all intiatives to provide protected water to their villages, still some households were not connected with water pipe lines and moreover the supply of water is only during a limited hours in the day. In all most all the 60 villages we have found many defunct handpumps and the first demand from the community during our introduction meeting would be to repair/replace the hand pumps. The rope pump installed in these villages have augmented the water need. In Tanjore district (Ekoventure), we have proposed to install rope pumps in 3 Schools. These 3 Schools do not have any water source and the staff arrange drinking water for the Children from the near by households or have to carry water from the common community tap. Can you please explain current sanitation facilities and habits? What, if any, will need to be improved or added to ensure quality of the water? . Can you please explain current sanitation facilities and habits? What, if any, will need to be improved or added to ensure quality of the water? my earlier post got cut off because of the use of the symbol "
my earlier post got cut off because of the use of the symbol "s application for a rope pump system to a large degree) and i hope they participate in the discussions). It seems that the rope pump will be fixed on top of a borehole and not attached to a dugwell (seen two diffent videos). 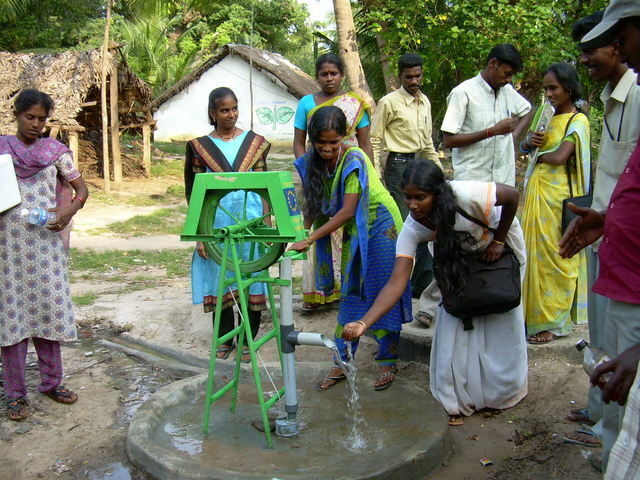 In West Bengal hand pumps (tubewells) are used that draw water from more than 350 feet. What are the advantages of these rope pumps over the hand pumps? The cost of one hand pump is Rs. 850/-. Recently a 32 feet handpump was installed that cost Rs.1700/- including the 1.5” dia pvc delivery pipe and labor charge. Cost of pvc pipe per feet is Rs. 7/- versus iron pipe that is Rs.75/-. In the old days iron pipes were used, nowadays cheap pvc pipes are in use. Project Well uses flexible pipes that floats in the dugwell water that gets adjusted with the fluctuating water level throughout the year. Fixed pipes were used initially that needed to be cut and extended with the change in the level of water during monsoon and summer seasons. Hence there was change in design. I think rope pump would be useful only to increase the popularity of dugwell due to the novel design in that part of the country. If water is withdrawn only from the deeper (bore) part of the dugwell then perhaps rope pump can be used replacing the flexible pipes. Need to discuss with the experts. Thank you Rajesh for the suggestion. It seems that the rope pump will be fixed on top of a borehole and not attached to a dugwell (seen two diffent videos). In West Bengal hand pumps (tubewells) are used that draw water from more than 350 feet. What are the advantages of these rope pumps over the hand pumps? Simple so local production and easy to maintain for users . Project Well uses flexible pipes that floats in the dugwell water that gets adjusted with the fluctuating water level throughout the year. Ans: As for the rope pumps in dug wells, the PVC pipes do not float but are kept straight with the Guidebox of cement. For dug wels cement guideboxes are proposed for Boreholes the new PVC guideboxes can be used. The parts of the pump are exposed? Is there not a risk of contamination of the water source? Ans: If well produced and installed (with a tapered well cover, and apron,) there is very little risk for contamination but the ropepump is a more open pump than a piston pump. If the water in the well is contaminated the pump wil not change that. If the water in the well is contaminated the part of the water used for drinking can be purified with simple filters for instance the Pureit or Siphon filter. I have the same questions as Rajesh about the problem of salt water intrusion as well as community contribution with the project. I'm also curious about the number of people you are serving: it seems there are 25 families in 5 villages, but there are 300 school children in each village as well? Are there many dispersed homes surrounding the villages? I like that you are including youth on your committees; I think that is a great way to involve them from an early age. I will bring that up with our staff. I'm also curious about if there are existing wells that you installing rope pumps on? Only in the budget is there a mention of bore holes. If there are existing wells, is there a plan for cleaning/treating the water in the well before installing the rope pump to ensure potable water? The parts of the pump are exposed? Is there not a risk of contamination of the water source? We use the rope pump in Nicaragua, and everything is contained. People are getting water from Municipitality corporation water supply schemes and that depends upon the current, when there is current they have water if there is no current no water. Getting water supply through Municipitality corporation water supply and they have to wait for particular time to get water. The women have made a queue in front of public tap, they face a problem, and they cannot do other work as they have to get water from tap at that particular time. Same problems exiting in the schools, and no proper chlorination of water. Health facilities’ existing in the state and area but awareness is lacking to handle water and due to high water table high chance of water contaminations are higher during flood and cyclones. That’s true that they will get salt water but our idea is to get fresh water and at all time. Rope pump doesn’t change the taste of water. After completion of Installation of rope pumps, the rope pumps will be handed over to the community and the community members are responsible to look after and maintain the rope pumps. The project will form WATSAN /VDC (water and sanitation committees or Village development committees) , they will be trained. Machines will be handed over to them to look after and maintain. After intervention of so many NGO’s in the area, Sanitation facilities in the area are not so good. 40% of the community have toilet facilities and out of 40% only 20 % using toilets 100%. Definitely we have planned to work on this line in the near future. During project implementation project staff will aware the community regarding sanitation and protect the water source not to contaminate them by doing simple things for example don't wash or bath near the portable water source. There are 100-300 house old in the villages but we are selecting the sites where either they are far from water point or they doesn't access water facilities from main water supply and saying minimum 25 families will get benefit out of one rope pump. In our area we have individual open wells not so many public, here we are looking for public facilities. I'm not sure I understand some of your responses to the questions above. 1. You said the idea is to get fresh water--how will you accomplish this? 2. Are the parts of the rope pump exposed? Do you think that will affect contamination of the water in the well? 3. Is this project only to install pumps on existing wells? Or will it include digging wells? If the latter, will they will be hand-dug or machine-dug? What is meant by documentation cost? With reference to your quarries - the rope pump can be fixed on open well or dug well but looking at South India it is not very common as we can see it in other places in India, South India especially TN is famous for Ponds. Rope pump is easy to maintain good point about rope pump its is made up of local resources and women SHG's members can repair it, no need to wait for technical people or wait for long to invite technical people from outside. Hand pumps are less cost when we install but after some time they cost us in terms of time, money and anxiety. We installed 177 rope pumps in four districts of Tamil Nadu and they are all working in the field for last one and half year. After installation after six -eight month we find some of the ropes had small problems and still working well. We got this technology from Practica Foundation of Netherlands if you want more information please visit there site. Regarding documentation we have asked some funds to document the whole process and make a film on production and installation of rope pump. Do both the rope pump projects need documentation? Can only one of the 2 projects produce the film? Do both the rope pump projects need documentation? Can only one of the 2 projects produce the film? Dear Rajesh, It is good if we can document both projects but I don't think we have this much of budget. we have one person who can make good films and I tought it is good to develop something new what we are going to do with this project. Greetings. kusum. It is good if we can document both projects but I don't think we have this much of budget. we have one person who can make good films and I tought it is good to develop something new what we are going to do with this project. Two projects are far from each other otherwise we would have manage with the same budget. We (Ekoventure) have not made any provision in the budget for documentation. However, we too will develop a short film during the project implementation. The project area of HPPI and Ekoventure are located in different districts and 175Kms apart. Maintenance cost is not considered hence need some kind of follow up or tracking program until sustainability is acheived. It will be interesting to observe over a few years the function of the VDCs. Good Luck. This are (both) worthwhile proposals. Want to then see how water for hygiene and sanitation projects can be layered on. While I'm still unsure about the issue of salt water intrusion, it seems this is a cost effective way to make it easier for many people to draw water. The committees are purposely designed to have full community participation. I'm also still somewhat unsure of the boreholes where the pumps are being installed--a pump was never installed or this is replacing? Certainly there is a need for this kind of project. The NGO is working in Tamil Nadu state in the coastal area that has been hardest hit by the Tsunami disaster affected area. The village community does not have access to the sweet potable drinking water due to the contamination of sea salt water. It is a good project; well planned and designed. It provides safe drinking water to the people and school children through the installation of rope pump on the bore well. The technology used is very simple, low cost and affordable with very less maintenance cost. The advantage of the technology is that the manufacturing of the pump can be done with locally available material in local workshop. The structure of the village development committee is well composed as it involves different representatives from different segments of the community. The sustenance of the project is also well thought as the skills of production, installation and maintenance of the rope pump would be transferred to the village community and they could manage on their own. The per person cost is very low with minimal care and maintenance and this simple technology could be adopted in other project areas also. WOTR would be interested in implementing the rope technology project in its project areas.